1. A person throws a ball upward into the air with an initial velocity of 20 m/s. Calculate how high it goes. Ignore air resistance. Acceleration due to gravity (g) = 10 m/s2. We use one of these kinematic equations for motion at constant acceleration, as shown below. We choose the upward direction as positive and downward direction as negative. 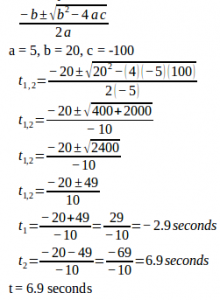 Acceleration of gravity (g) = – 10 m/s2 (negative downward). 2. A person throws a stone upward at 20 m/s while standing on the edge of a cliff, so that the stone can fall to the base of the cliff 100 meters below. (a) How long does it take the ball to reach the base of the cliff (b) Final velocity just before stone strikes the ground. Acceleration due to gravity (g) = 10 m/s2. Ignore air resistance. Initial velocity (vo) = 20 m/s (positive upward), Acceleration of gravity (g) = -10 m/s2 (negative downward).